I see from your comment to ODE you have seen it before, (switch all the lights out)!!! I’m putting together a little history item which I’ll send you anon which should be of interest. Of course it’s from Mauripur and Dave Holman our secretary is quite happy if we would like to put it the UKMAMS newsletter. I would be interested in the information from your Oman correspondent - had the doubtful privilege of putting BERS off-air when I was in Masirah when we contaminated their fuel supply - not a popular move! Can you forward a copy of this info on the Omancen to me, I have got a few others I will forward it onto. I know that ex-members of SOAF have reunions on an annual basis but I have yet to stir my rear end and get over to the UK for one of them. This sounds like it might be of interest. It was announced earlier this week that the Airbus A400M will be based at Brize Norton with the addition of 700 personnel to maintain it. This is supposed to occur around 2010. At the same time the C130K will be phased out of service with the loss of 800 service posts. Reasons given for not considering Lyneham include poor refuelling facilities, short runway, hangars will not accommodate an A400M and weather! I won't comment at this time but obviously all those Vc10 and TriStar weather diversions from Brize to Lyneham that were handled over the years have been a figment of our imagination. Although there is already some doom and gloom amongst the locals, the fate of RAF Lyneham has not yet been decided as that is part of the SDR (Strategic Defence Review). A Home for the C130J must be found if Lyneham closes but it could remain in existence as a home for all the Combat Support Units - MAMS, TCW, MCSU etc. We cannot see the A400M being built as the Germans have reneged three times so far on signing up for it and they are supposed to be ordering 75 aircraft. Nobody can understand why they want so many unless they're going to have another go at Russia! The attached note should be self-explanatory - Hope is alive! I have been passed your letter yesterday 16/8/02. It was a spooky coincidence Ken Wright has been asking about you and your address and if you were still about. Colin Allan had it in the back of his mind that you had crossed over to the other side. Then out of the blue last night at the association committee meeting this young Rodney announced that he had some mail and address changes. I took a quick look through them during the meeting. There was letter from your good self. Great chuckling and merriment that the theory had been proved incorrect. 2nd (1979 ish) sighting Denmark when you came as part of a MAMS team to recover 12 Sqdn at the time I was on Mobility at Honington. Ian Berry sent a mail to Ken remembering a trip you had with him I will print it off and put with this letter. Back to the Association please complete enclosed form send cheque and form back to above address and I will send membership card. Or you can complete STO payment. Route steal at present is £25 for 5 years. A subject that has often come up in over the past year or so in Sandscript, the Mauripur Association's quarterly newsletter, is Lord Mountbatten's personal aircraft Avro York MW102 which was a very luxuriously furnished machine built as a VIP aircraft at Ringway for the use of Earl Mountbatten as Viceroy of India. It went to 511 Squadron at Lyneham in 1943 arriving in India in April 1944. I’ve put a compilation together from their memories in ‘Sandscript’ over the past year or so from half a dozen lads stationed there at Mauripur in various ASF trades 1947 to 49 who worked on MW102. It was the second York to come into service, it was said that the oldest was MW101 which was Monty’s personal aircraft. The problem started when they had to drill out the old rivets and try to replace them with a rivet gun. This item had a strong spring so when the new rivet clicked into place it would probably pop out another 2 or 3 rivets; and if lucky you might get away with 5 or 6 rivets. If you were unlucky on a bad day you would get a dozen or more pop out. Of course the reason for this problem was because it was the most bulled up aircraft in the Command, it was so highly polished each time it landed, four men worked on it at a time. Brasso was just about unobtainable for any one else. The heads of the rivets were that worn down from the constant polishing and it was reputed that as a result of all this polishing the fuselage had a ten degree twist in it. It was recorded that on one service whilst in the UK they replaced over 300 rivets. The cleaning of the aircraft was undertaken by Indian workers and problems were a regular thing caused by the caste system, the interior was the sweeper’s job whilst the task of emptying the toilet demanded the services of a coolie. Problems arose when only one of these ‘craftsmen’ was available because rather than do the other person’s job they would die first. There were numerous mechanical problems with the aircraft and one funny thing, though not at the time, was when there were regular serious failures on the hydraulics and on one occasion after repairs the crew decided that on the test flight they would take parachutes and insisted that the one and only parachute packer at Mauripur flew with them; he was less than enthusiastic at the prospect and during the test flight sat quaking in his boots watching the hydraulic fluid dribbling from the undercarriage doors in the slipstream. Luckily as it turned out the undercarriage worked as it should have done and they landed back with their hearts in their mouths and eyes on the wheels which locked as they should have done. MW102 was seen in 1945 by one of the lads at Kallang Airport in Singapore just after the Jap surrender and it was rumoured that Mountbatten allowed it to be used to fly POW’s home as did the Duke of Gloucester’s York was used to fly Aussie POW’s home to Oz. When Mountbatten ended his last Envoy in 47 and arranged the partition of India, it was said that he wasn’t taking anything with him back to the UK. However the aircraft was packed tight with stuff. A test flight was taken and after about ten minutes of flying over Karachi one of the crew rushed into the cabin, looked under the wing near the wheel area, and sure enough showers of hydraulics were pouring out, thankfully a safe landing was made back at Mauripur. The Meet and Greet will be held in the 'Winch Inn' at Lyneham on Fri 30th August starting at 5pm with twofers going on at 7pm. All including non-Assn members are very welcome. There will also be a curry provided from Assn Funds. The Association AGM will take place on Sat 31st August in the UKMAMS Crewroom (MAMS HQ) at 11am. As an enticement for members to attend they will receive two free beer tickets and a free hamburger ticket! Everyone is encouraged to attend. 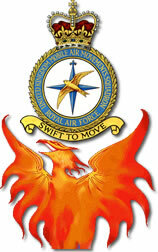 This AGM precedes the Sqn Families Day to which again everyone is welcome. A “Husband Shopping Centre” was opened where a woman could go to choose from among many men to be her husband. It was laid out in five floors, with the men increasing in positive attributes as you ascended up the floors. The only rule was, once you opened the door to any floor, you must choose a man from that floor, and if you went up a floor, you couldn’t go back down except to leave the place. So, a couple of girlfriends go to the place to find men. Second floor says: “These men have high paying jobs, love kids, and are extremely good looking”. “Hmmm”, say the girls, “But, I wonder what’s further up?”. Third floor: “These men have high paying jobs, are extremely good looking, love kids and help with the housework.” “Wow!” say the women. “Very tempting, BUT, there’s more further up!” And so again, they go up. So up to the fifth floor they go.